Our series of tips to help you leverage the power of design and creativity to grow your business. This week: 08. 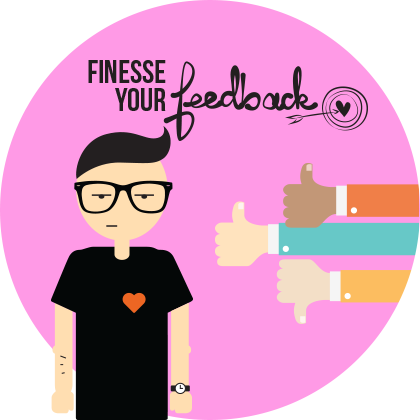 Finesse your feedback. There are three key things to weigh up when reviewing design concepts – 1) audience, 2) audience and errrrr……3) audience! It’s important to assess the work objectively rather than subjectively. For example, try to focus on whether the creative approach will help you achieve the aims you set out in the final design brief rather than being subjective and just saying, “I like it” or, “I don’t like it”. If you don’t have clear enough aims or direction in your brief then perhaps you need to add them at that point e.g. is the design trying to help you reach new customers? Reach new markets? Innovate or position your company or your product differently? You may want to test your design with customers at some point too, and allow time in your project schedule for changes based on their responses. It can really help refine the design to ensure it works best for the most important people in the process – the target audience.